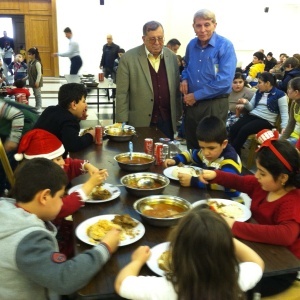 I was fortunate to witness firsthand the 2014 Christmas for Refugees program and its tremendous impact upon Middle East refugees including hundreds of individual needy children and their families as I accompanied program director William J. Murray. Unlike many humanitarian feeding programs, Christmas for Refugees presented the Christmas story and the “reason for the season,” the coming of the Lord and Savior, Jesus Christ. At each Christmas meal event the birth of Christ was explained in detail in puppet shows and through each event coordinator and pastor. Children even received a special colorful comic book describing the true meaning of Christmas. Instead of spending money on renting event banquet halls, local churches were utilized for free. The local pastors obviously knew most of the precise, devastating situations of most of the refugee families registered with their church, and the particular needs of each family. Although the Christmas for Refugees program is designed for Syrian and Iraqi refugee children who are considered Christian, Muslim children were welcomed if their parents agreed to have their children hear the Christmas story. The children loudly and vibrantly sang Christmas carols like “Silent Night”, and thoroughly understood that Bethlehem meant “the birth of the Savior of the world at Christmas.” Both Christian and Muslim refugee children sang out with all their hearts. In the city of Zahle near the Bekaa Valley, a chruch helped in this monumental effort to reach refugee children. On the way to this particular church our team passed within less than a few hundred feet of a “tent city” of refugees that was immense. The number of refugees is staggering. Parents of the refugee children, having suffered so much when forced to flee their homeland in Syria by ISIL warriors, also participated in their own service while their children enjoyed a meal they were accustomed to in their own culture. The care and concern of the local administrators was quite striking. They reached out to every child in a most caring way. In an ordered way, many hundreds in Lebanon received their Christmas ministry, meal, food, Christmas story comic books and prayer. The Lebanese evangelical group was the lead organization to coordinate these successful events in Lebanon and their work was superb. The tragedy is that in order to have enough food to give out when there is such an overwhelming crush of new refugees, some distribution points had to limit attendance to children of certain ages (6-12) and to families who were on a waiting list for food and not currently receiving food from various programs. In Lebanon, rather than food parcels, each participating family received a voucher for $40.00 worth of food at a local market of their choice. To receive the voucher the families were pre-qualified with the local pastor, and their children had to actually attend the program event. Program director William J. Murray and I met with some leading pastors of the Assyrian and Chaldean churches, who also participated in the Christmas programs. Here was the tragedy: looking into the “pleading” eyes of that Chaldean priest who showed us the list of over 800 children he had registered. Unfortunately, the original budget was for only 100 meals. That priest had to make the tough decisions. It is my deep prayer that next year, everyone who wants, will be fed and blessed Fortunately the program was able to increase the number of children at that church by 200, all newly arrived Iraqi Christian children from Mosul. In Jordan the Christmas for Refugees program was being delivered this year to over 1,000 mostly Iraqi Christian refugee children plus their parents. In Jordan, as in Lebanon, they are being given a genuine Christmas, in spite of their horrific circumstances. In Jordan the program partnered with Manara International to make the best Christmas these refugee children could experience, considering the extremely crowded, poor and uncomfortable living situations they now find themselves in. 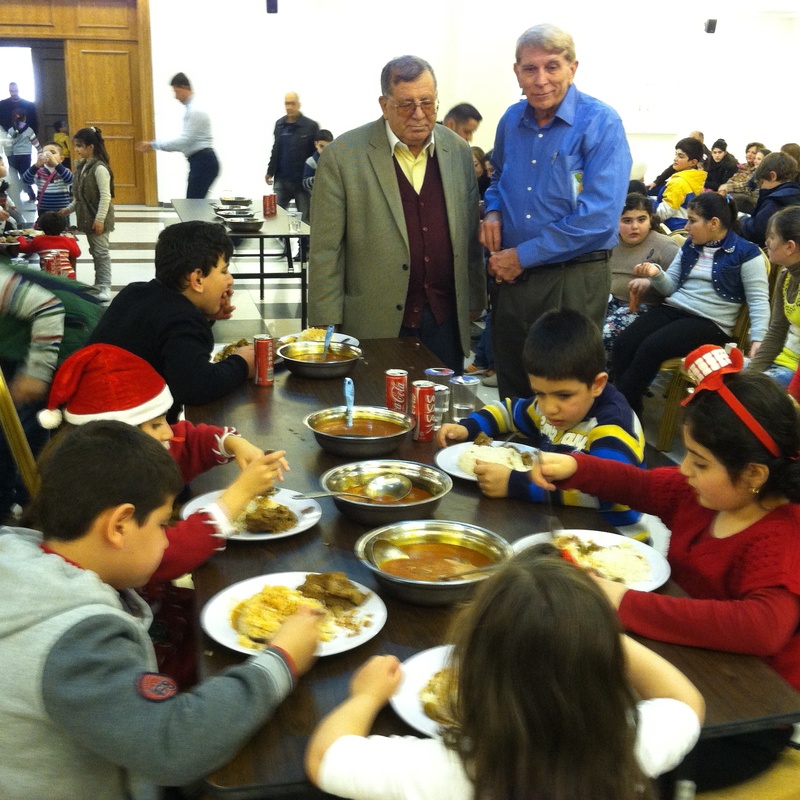 As in Lebanon, donations from caring and supportive Americans helped to give a Christmas dinner, the Christmas story, Christmas carols, a bag of candy, an entire week’s worth of food for an entire family (called a “Joy Bag”), as well as the encouragement of prayer and Christian concern for frightened, displaced Christian refugees. Over 300 children and their parents received this wonderful Christian program the week before Christmas at just one event held at an Orthodox Church. In all over 1,000 refugee children in Jordan were reached during the Christmas season. The Bible Society of Jordan participated as well, giving each family an adult Bible, a children’s picture Bible and children’s coloring and activity books with stories from the Old and New Testaments. Santa Claus and Winnie the Pooh visited the Christmas event at the new St. Ephraim Orthodox Church in Amman (headed by Priest Emmanuel) to greet the children and at the end of the dinner also gave each child a bag of candy supplied by the program, much to their delight. Despite deplorable conditions and an extremely bleak future, the laughter of the children could be heard and the ear-to-ear smiles could be seen on the faces of so many children in Jordan as they experienced a true Christmas celebration far from their homes in an unfamiliar place. Grateful refugee parents shed tears of joy at seeing their children being able to have a Christmas celebration despite the horrid situation they find themselves in currently. It must be emphasized that the Christmas program events presented in both Lebanon and Jordan were truly non-denominational. Christmas events were held at evangelical, Orthodox and Catholic churches. The Christmas for Refugees program was accepted and greatly helped by churches off all faiths in both nations. Despite the overwhelming refugee crisis this Christmas, there was at least some joy and hope given to some of the tens of thousands of refugee families because of the Religious Freedom Coalition’s Christmas for Refugee program.